On 7th October 2015, RAW in WAR (Reach All Women in WAR) celebrated the incredible courage and inspiring work of Kholoud Waleed, a journalist and editor of the underground newspaper ‘Enab Baladi’. 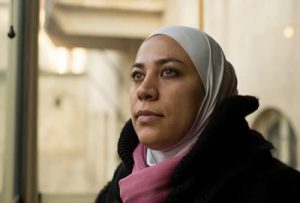 Kholoud Waleed, co-founder of ‘Enab Baladi’(Grapes of my Country) bravely reports to the world and to the people in Syria about the atrocities of the conflict, despite the dangers, she and her colleagues face every day. Three of the newspaper journalists were killed and others were detained in Syria. Kholoud Waleed’s reporting, and ‘Enab Baladi’, form a small island of truth and respect for the people in Syria amidst the horrors of the war. In 2012, alongside a group of female friends, Kholoud Waleed started organising demonstrations calling for democracy, free elections and human rights. The group also helped children and other family members of those who had been killed or detained. The group then founded ‘Enab Baladi‘ – a newspaper reporting about daily life in Syria, exposing the war crimes against civilians and the ongoing oppression of independent voices. The group behind ‘Enab Baladi’, most of them women, have to hide and write under pseudonyms, and the majority are either in hiding in Syria or are refugees in Turkey and Lebanon. Khaloud and her colleagues are facing daily the threat of detention or death if the authorities find out they write for ‘Enab Baladi’. Despite the danger to her life, Kholoud has worked tirelessly in order to inform people in Syria about the atrocities and war crimes they are suffering and to speak out against the violence the country and its citizens are enduring. A copy of ‘Enab Baladi’. She had to go into hiding and leave Syria when three of her friends were detained by government forces and they came looking for her. In this, she reminds us of Anna Politkovskaya, who in the face of grave danger to her own life, continued to write against violence and human rights abuses against civilians in Chechnya. On the 9th anniversary of Anna Politkovskaya’s murder, RAW in WAR honoured Kholoud Waleed with the 2015 Anna Politkovskaya Award for her courage to speak out and to give a voice to the many Syrian people whose voices cannot be heard amidst the bombing and persecution in the rapidly disintegrating Syria. RAW in WAR marks the anniversary of Anna Politkovskaya’s murder by giving the award in her name to a woman, who, like Anna, speaks truth to power. “It means a lot to me to receive the Anna Politkovskaya Award, named after a Russian journalist who was assassinated for exposing the Russian crimes in Chechnya to the world. Ironically, her assassin has not been brought to justice yet, the same like the assassin of Syria is still ruling it, after five years of brutality against the Syrian people, who aspired for freedom and change. It is also painful to follow in the steps of Razan Zeitouneh, and be in her own place receiving this award, without having her by my side. Razan was kidnapped by the “Army of Islam”, who was supposed to protect us, the Syrians, but turned out that they too do not tolerate free voices, who are exposing the truth about the war crimes in Syria. The award was presented to Kholoud Waleed in person at RAW in WAR’s ‘Refusing to be Silenced’ event, part of the 2016 Women of the World (WOW) Festival in London. 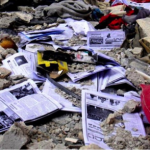 Copies of ‘Enab Baladi’ in the midst of the devastation in Syria. The RAW in WAR Nominations Committee for the 2015 Anna Politkovskaya Award was deeply humbled by the determination shown by Kholoud Waleed, reflecting the spirit that Anna Politkovskaya showed in her life. RAW in WAR continues to remember the life of Anna Politkovskaya by working to support brave women human rights defenders in conflict zones throughout the world. It is an honor to receive this award in your name, nine years after evil power assassinated you to silence the free word. In this time when my country has been struck by all evil powers to suppress those who have called for freedom and dignity in the last five years. your steps were followed by many Syrians who paid with their life in return for their passion for truth. 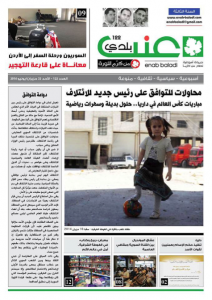 Enab Baladi, my newspaper, was co-founded by a group of young passionate Syrians. We want to convey the atrocities committed by the Assad regime to the world. The cost of this has been very high, as three colleagues have been killed since then. Four of my colleagues are being held by the regime, four other female reporters were detained and later on released. Can you imagine the cost of truth in Syria? And this is only for one media platform as the numbers increase every single day. Anna, nothing much has changed in the context of human rights since you left us, women are still abused in most parts of the world, journalists are assassinated, human rights activists detained, and the world is still turning a deaf ear it all. My colleague Razan Zaitouna, who received this award in your name in 2011 has been disappeared, and her voice has also been silenced. No one likes free voices Anna, unfortunately! This award is granted not to me, rather to a whole group of dedicated young men and women who have battled war through their words and reports to the world. We want to deliver the messages of those Syrians who are surviving the war despite all types of threats they face daily. This award is a big motivation for me and my colleagues to maintain our passion for truth and continue telling the stories untold for the Syrians who continue their lives within Syria, despite ongoing death and destruction surrounding them. The stories of people who called for freedom and change and still aspire this, and who have dreams that are unfulfilled. Dear Anna, despite all the hardships, the Syrians will continue their struggle to reach the light at the end of this dark and scary tunnel. For the same reason you paid with your life. So, may your soul rest in peace and know that the candle you lit will never be put out.